Do you have an empty fish bowl that you are just dying to use in a DIY project? Maybe you have it left over from an old fish or maybe, you found out that these things are really cheap at the Dollar Store and just decided to buy a few. Either way, there are some really amazing things that you can use those fish bowls for and I have a list of 10 of the best. If you have ever wanted a DIY project to give that old fish bowl new life, now is your chance. You will definitely find something that you want to upcycle that fish bowl into in these 10 fabulous fish bowl upcycle ideas. I do love to upcycle things. In fact, I rarely throw anything out, even if it is broken. I mean, if you can fix it or upcycle it, then why not do it? Just check out these 20 crafty DIY ideas to upcycle broken mirrors. There is literally an upcycle project that you can do with just about anything. Whether you want new home décor or maybe you are planning a wedding and need table decorations for the reception, there is a way to reuse a fish bowl to meet your needs. And, all of these are super easy to put together. I just love the shape of fish bowls for some reason and they really do make the most wonderful vases and terrariums. Did you know that you could also turn them into candy dispensers? Or how about snowmen? 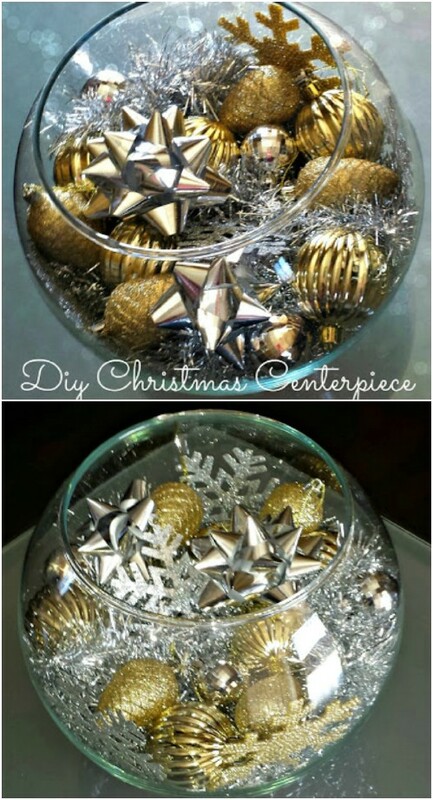 There are so many wonderful ways to upcycle those fish bowls into something fun and new and I have the best 10 ideas of all for you. I hope you love these as much as I do and while you are looking at some DIY home décor, be sure to also take a look at these 25 DIY decorative plates. They will give your dishes a lovely hand painted look. 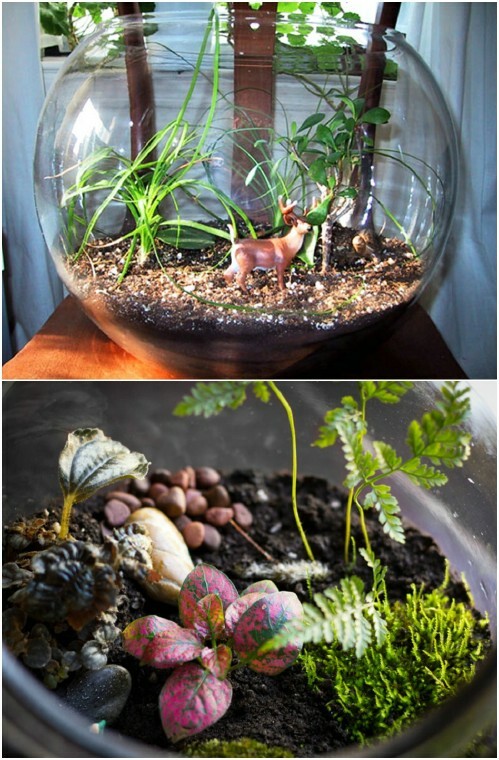 A terrarium is a wonderful way to upcycle that old fish bowl and turn it into something new and useful once again. You can build your fish bowl terrarium however you like and this is one of the easiest things in the world to do. I personally love succulent terrariums, but you could do these with any number of plants. Or, if you are theming your terrarium with woodland creatures, fairies or other themes, you can use moss for the greenery. 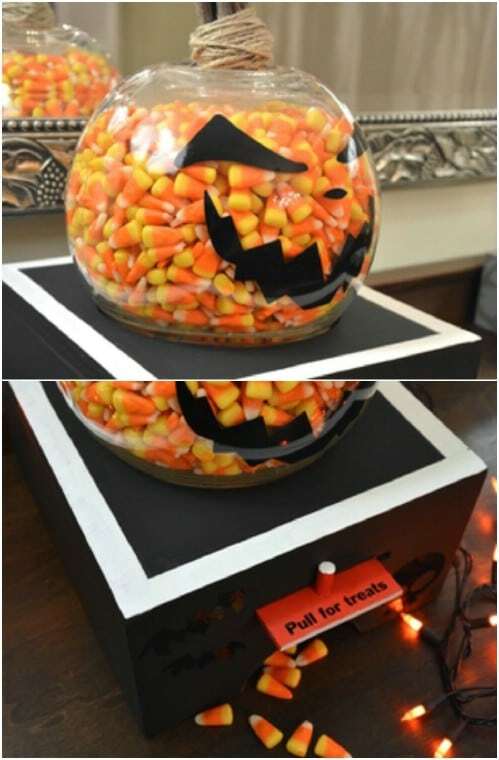 This particular DIY candy dispenser, that is made from an upcycled fish bowl, is for Halloween, but you can skip the theme altogether and just have an amazing DIY candy dispenser at your disposal. This one is really easy and so adorable. Aside from the fish bowl, you will also need to build a wooden box and you’ll need to master the use of a few power tools. When you’re finished, this is going to be your favorite party accessory! 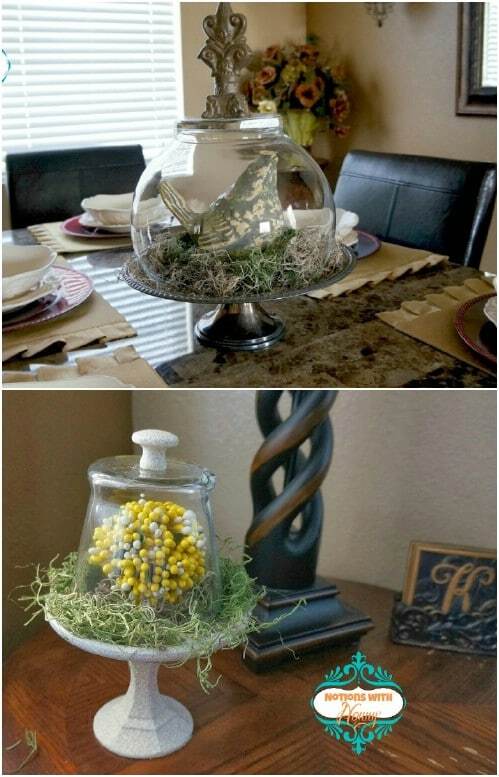 You can use fish bowls to create any number of gorgeous centerpieces. You don’t have to just do these for the holidays, you can change out the decorations that are inside and use them all year long. These would make beautiful DIY Easter centerpieces – just add colorful eggs. Fish bowls also make the most beautiful wedding table decorations. Just add flowers or ornaments of the color that you need and you can even surround them with LED lights or battery operated string lights. Just a few cheap craft supplies, along with that fish bowl, can be turned into a gorgeous candle. I love the glitter on this one and it would make an amazing centerpiece. You could turn it into a floating candle holder and with the glitter, the light from the floating candle would be absolutely beautiful. This one only takes a few minutes to make and it’s really cheap, considering you can get a nice fish bowl at the Dollar Store for just a couple of dollars. 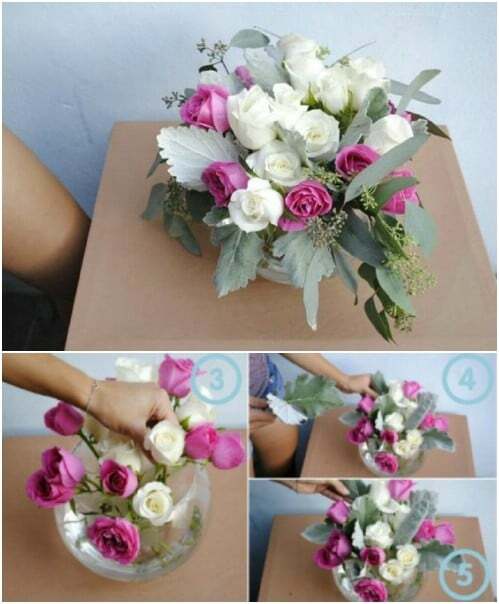 Here’s a great floral centerpiece that is perfect for weddings or you could just use this idea to showcase your fresh flowers at home. You can turn an ordinary fish bowl into a vase by simply adding your flowers. Note that you will need to cut flowers a bit shorter for a fish bowl than you would for a traditional base but when this is finished it is absolutely stunning. And, this one makes a wonderful gift that will rival anything your local florist can send. 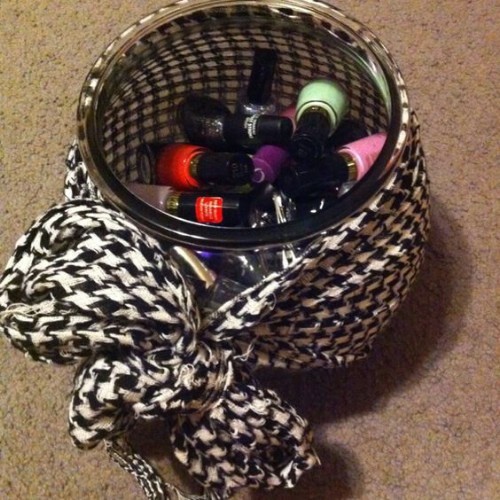 I love this fish bowl turned nail polish holder! What I love about it, aside from the fact that it is cheap and easy to make, is that you really can’t even tell it is a fish bowl. The scarf tied over it makes it look so decorative! You can leave off the scarf but really, it gives it such a sophisticated look, don’t you think. This one may not cost you anything if you have an old scarf and of course, a fish bowl on hand. How adorable is this fish bowl snowman? He is made from stacking three fish bowls on top of each other and he is the most adorable holiday decoration that I have ever seen. It’s not just that you stack the fish bowls to make a snowman with this one. You fill those fish bowls with fake snow and other things that get you into the holiday spirit. This is a good DIY project for before the holidays. Get a few of these made so that you can share them with others! Whether it’s the holidays or not, snow globes are the best. 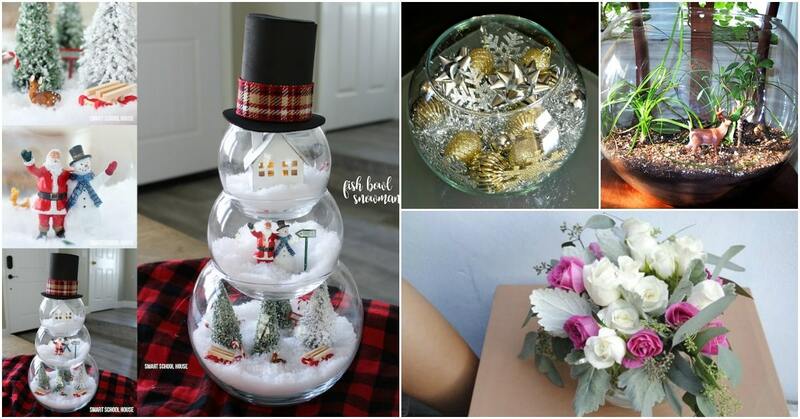 You can make your own with an old fish bowl and fill it with things that you want to see in your snow globe. 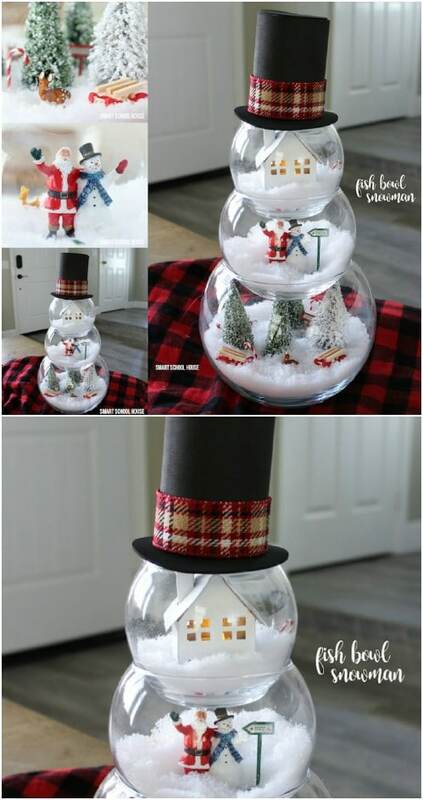 I love this idea for doing winter crafts with kids – for those days when it’s just too cold to get outside. You will of course, need a base. 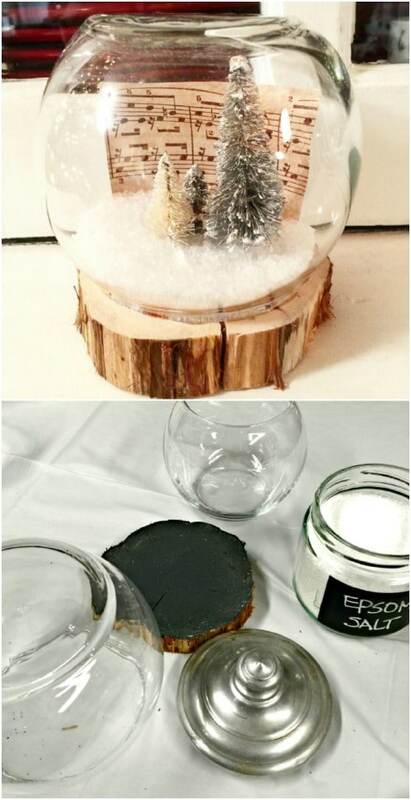 A slab of wood works really well and gives your snow globe a nice rustic look. Do you love cloches? Have you priced them lately? Those things are rather expensive and as beautiful as they are, I just can’t justify spending nearly $100 for a small piece of décor. But, I can justify buying a $2 fish bowl from the Dollar Store and making my own. This is one of my favorite DIY fish bowl upcycle projects. You turn that fish bowl, along with a few other cheap Dollar Store supplies, into the most beautiful cloche and you save a bundle doing it yourself. The holidays may be over but that doesn’t mean you can’t plan for next year, right? 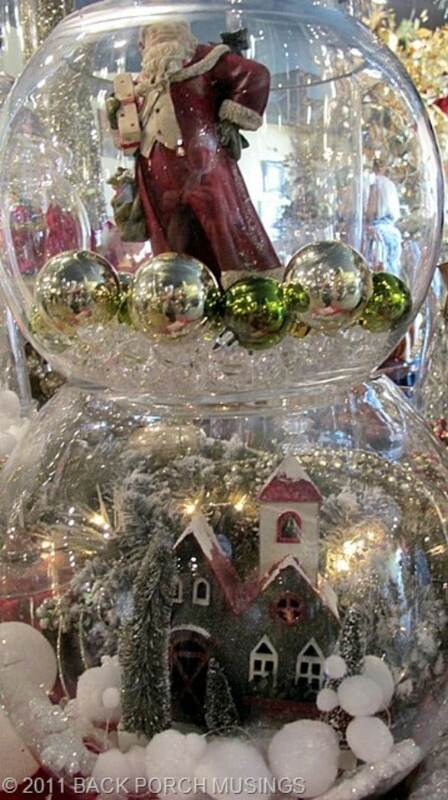 If you have a couple of fish bowls, simply stack them on top of each other for some beautiful holiday décor. This would work really well on the porch as well – although I would use plastic fish bowls for outdoors, especially if you live in an area that gets pretty cold around the holidays. You could also do this with Easter decorations or even create your own DIY Fourth of July decorations. These would make wonderful patriotic Fourth of July crafts. Wow! Beautifully decorated fish bowls! I will try out these ideas for sure! Thank You so much for sharing such creative tips! !